Rises along Ganges-Yarlung Tsangpo watershed and flows south through Himalaya, Lesser Himalaya, Jogbudha Valley, Shivalik Hills and Terai, then SE across plains to join Ghaghra River. The Sharda River demarcates Nepal's western border with India. It descends from 3,600 m (11,800 ft) at Kalapani to 200 m (660 ft) as it enters the Terai plains in Uttar Pradesh, flowing southeast across the plains to join the Ghaghra river, a tributary of the Ganges. It is called Mahakali River in Nepali: महाकाली नदी, mahākālī nadī, शारदा नदी, shāradā nadī in Hindi, and Kali Gad (Hindi: काली गाड़, kālī gād) or Kali Ganga in Uttarakhand. It is named after Śāradā, which is another name for Saraswati, the goddess of learning. It offers potential for hydroelectric power generation. The river is also proposed as source for one of the many projects in the Himalayan component of the Indian Rivers Inter-link project. The traditional source of the (Maha)Kali is the pond of the Kali temple at Kalapani. The geographic sources, however, are some five kilometers further north and some thousand metres higher: streams emerging from glaciers along the watershed with the uppermost Humla Karnali. India's border with China's Tibet Autonomous Region follows this watershed. Below Kalapani the river has been Nepal's western border with India since the Sugauli Treaty concluding the Anglo-Nepalese War of 1814–16. The Kali receives the right-bank (R) Dhauliganga—not to be confused with the Alaknanda tributary—at Tawaghat (29º57'N, 80º36'E). It passes a town Dharchula (R) and receives Gori Ganga at Jauljibi (R), exiting the high mountains that reach into the alpine zone. At 29º36'N, 80º24'E the first important left-bank (L) tributary from Nepal, the Chameliya joins after flowing southwest from Nepal's Gurans Himal (including Api). A bazaar town Jhulaghat (29º34', 80º21') is on both sides of the river. Then the Kali receives the Sarju River (R) at 29º27'N, 80º15'E. The area around Pancheshwar (R) is called Kali Kumaon. The Kali exits the Hill Region at Jogbudha Valley and receives two tributaries: Ladhiya (R) at 29º12'N, 80º14'E and Ramgun (L) at 29º9'N, 80º16'E. Then it enters the lower Shivalik Hills. Tanakpur (R) town is just above Dam of Sharda Reservoir at 29º3"N, 80º7"E where water is diverted into an irrigation canal. The river exits the last hills into the Terai plains, passing towns Banbasa (R) and Mahendranagar (Bhim Datta) (L). At 29º0'N, 80º7'E the Iran-Indonesia AH2 Asian highway route crosses as Nepal's east-west Mahendra Highway connects with India's National Highway 125. The international border then turns west of the river to follow a previous channel for some 10 km. Here the river leaves Uttarakhand and crosses into Uttar Pradesh. Then the international border bends east, recrossing and leaving the river after following it for 223 km (139 mi). Now the river's name changes to Sharda. It flows southeast another 100 km (62 mi) in Uttar Pradesh to join the Ghaghra (Karnali) as a right-bank tributary at 27º39'N, 81º17'E, some 30 km. NNW of Bahraich. The river attracted media attention in 2007, over the Kali river goonch attacks that cost three lives, probably by an exceptionally large catfish of the Bagarius yarrelli species. Efforts to capture the offending fish were shown in episodes of a documentary television program River Monsters. The Pancheshwar Dam, a joint venture of India and Nepal for irrigation and hydro-electric power generation was proposed on this river, in 1995, named as Sarayu or Kali River. However, Nepal and India have been unable to reach a decision on the 5,600-MW Pancheshwar multipurpose dam project, in part because of political changes both in Nepal and India. The project became a priority again in 2013, and negotiations restarted. The Tanakpur Hydroelectric Project (120MW) was commissioned in April 1993 by the NHPC, with a barrage on the Sharda River near the town of Tanakpur in the district of Champawat. In Nepal, it lies entirely in the Sudurpashchim Pradesh of Nepal and in the Mahakali Zone which has four administrative districts – Baitadi District with Baitadi as its headquarters, Dadeldhura District with Dadeldhura as its headquarters, Darchula District with Darchula as its headquarters and Kanchanpur District with Mahendranagar as its headquarters. 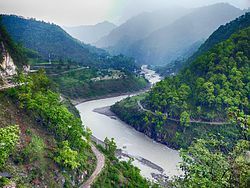 In India it lies along the Kumaon division of Uttarakhand state, Pithoragarh district, Champawat district and part of Udham Singh Nagar district fall under the Sharda basin. No large tributary joins the Sharda between Upper Sharda and Lower Sharda barrages in India. In Uttar Pradesh, part of Lakhimpur Kheri district is also under the Sharda basin. Mahakali (Sharda in India) is one of the five major river basins of Nepal which is shared with India and has a total basin area of 14871 km up to Upper Sharda Barrage, about 34 per cent of which lies in Nepal. The total catchment area is 17,818 km up to Lower Sharda Barrage. Notable national parks are the Shuklaphanta National Park in Nepal and Dudhwa National Park in India. The Shuklaphanta National Park was established in 1976 as a wildlife reserve and covers an area of 305 km2 (118 sq mi) in the Kanchanpur District of the Far-Western Region, Nepal. The protected area supports a wide range of nationally and globally important biodiversity, including 46 mammal species. The prevalent vegetation is grassland. Forest stands comprise sal, Khair and sissoo. This protected area hosts the worldwide largest herd of swamp deer, and 423 bird species including the largest population of Bengal florican. It has a common boundary with the Indian state of Uttar Pradesh in the south and west which is formed by the Mahakali (Sharda) River, and is bordered on the east by the Chaudhar River and in the north by a forest belt and cultivations. The Dudhwa National Park is located at India-Nepal border, in Uttar Pradesh in India. The northern edge of the Park lies along the Indo-Nepal border, and the southern boundary is formed by the Suheli River. The terrain of the park varies from mosaic grasslands, dense sal forests and swampy marshes. It has diverse wildlife population. Another reserve area "Kishanpur Pashu Vihar" sanctuary located about 30 km from Dudhwa. spread over about 204 sqr.km, lies on the banks of river Sharda and is surrounded by Sal forest of adjoining reserve forests. In 1987 Dudhwa National Park and Kishanpur Pashu Vihar were merged to form the Dudhwa Tiger Reserve (DTR). Although the Tigers at the Park are numerous, sightings are rare due to the thick forest cover of the area. Besides Tigers, Leopards, Hispid Hares, Swamp Deer (Barasingha) and Rhinos thrive amidst the vegetation, it is home to 400 species of resident and migratory birds, 37 species of mammals and 16 species of reptiles Main Wildlife found are Swamp Deer, Chital, Hog Deer, Sambar, Rhino. As the river flows down from the Nepal border through Kumaon hills and as the Kali and Gori Rivers meet at Jauljibi, with increased water volume, it offers great river rafting adventure to professionals, for a length of 117 km, from Jauljibi to Tanakpur. In rafting parlance, in this stretch, the rapids in the river are of Grade IV and more, which could be covered in 3 days. Below Tanakpur, Lower down among the frosted slopes, the river becomes calmer offering the amateur a sporting challenge. The Treaty on Integrated Development of Mahakali River was signed by the Prime Minister of His Majesty's Government of Nepal and the Prime Minister of the Government of India in February 1996 and which came into effect in June 1997. It concerns with the Integrated Development of the Mahakali (Sharda in India) River including Sharda Barrage (existing), Tanakpur Barrage (existing) and Pancheshwar Project (Proposed – under Planning). Pancheshwar Multipurpose Project (PMP) on the river Mahakali is the centerpiece of the Treaty. The Treaty has 12 Articles with a preamble. As per the Treaty principles both sides are committed to design and operate the project as a single, integrated scheme to yield, "the maximum total net benefits accruing to them". The power benefit is to be assessed on the basis of saving in costs as compared with the relevant alternatives available. As per the Treaty "equal entitlement in the utilisation of the waters of the Mahakali River "without prejudice to their respective existing consumptive uses" is also planned to be ensured from the PMP. Following the conclusion of this Treaty, the earlier understandings reached between the parties concerning the utilisation of the waters of the Mahakali River from the Sharda Barrage and the Tanakpur Barrage, which have been incorporated herein, shall be deemed to have been replaced by this Treaty. This Treaty shall be subject to ratification and shall enter into force on the date of exchange of instruments of ratification. It shall remain valid for a period of seventy-five (75) years from the date of its entry into force. This Treaty shall be reviewed by both the parties at ten (10) years interval or earlier as required by either party and make amendments thereto, if necessary. Agreements, as required, shall be entered into by the parties to give effect to the provisions of this Treaty. As per a submission by the DDP Secretariat of the United Nations Environment Programme (UNEP) on Dams and Development Project, on the Mahakali Treaty it is stated that "the Treaty emphasizes an integrated approach to the development of water resources and, more importantly, attempts to validate past activities taken to develop water resources on the Mahakali River." UNEP has in conclusion observed that "the signing of the Mahakali Treaty has indeed provided India and Nepal with an opportunity for meaningful cooperation to benefit the millions of people in the two countries whose livelihood depends on the waters of the Mahakali River." Some details of the projects referred in the Treaty are elaborated below. The Sharda Barrage on the Sharda River (Mahakali River), the first irrigation project on the river, was built in the 1920s under an Agreement signed between British India and Nepal (Sharda Agreement Letters of Exchange dated 23 August 1920 and 12 October 1920) to exchange 4000 acres (for a compensation of Rs 50,000 to Nepal) of the eastern flank of West Nepal. It still regulates the diversion of the (Sharda) Mahakali River exclusively for the purpose of irrigation and power in Uttar Pradesh in India. Before 1920 the Mahakali was a border river with the left bank in Nepal and the right bank in India. The Sharda Agreement of 1920-transferred ownership of part of the left bank area (in the vicinity of the Barrage) from Nepal to India and the Sharda Barrage belongs to India. This agreement has been subsumed in the Mahakali Treaty signed in February 1996 (referred above) and ratified on 27 November 1996. which entails the following supply from the Sharda Barrage to Nepal. Although the Sharda Agreement was made in 1920, Nepal could utilise her share of the water only after the construction of the Mahakali Irrigation Project in 1975. Water is diverted from the Barrage to the Sharda Right Bank Canal, (with a capacity of about 396 m³/s) (2), for irrigation in India. In addition to the irrigation facilities, India also generates hydropower with an installed capacity of 41 MW from the canal head power station.An extensive effort for developing irrigation potential and for the maintenance of the canal with its branches, feeders, tributaries, channels and drain was undertaken by Engineer Abinash Chandra Chaturvedi during 1961-65 in Sitapur District of Uttar Pradesh. It has since served as a model scheme for irrigation engineers. The Lower Sharda Barrage is constructed on the Sharda River, about 163.5 km downstream of the Upper Sharda Barrage, and nearly 28 km from Lakhimpur city. This project is part of the Sharda Sahayak Pariyojana (SSP) and primarily depends on water diverted from the Karnali (Ghaghra) at Girjapur through the Sharda Sahayak link canal of 28.4 km length for over eight months in the year during the lean season; but it indents on Sharda supplies during the monsoon between July and October when the Karnali carries a lot of silt. The SSP aims at irrigating culturable command area (CCA) of 16,770 km2 with 70 per cent irrigation intensity. The 258.80 km long feeder channel of SSP takes off from the right bank of Sharda Barrage with discharge of 650 m3/s. Supplies are then fed into the different branches of the Sharda canal system, namely, the Daryabad branch, the Barabanki branch, the Haidergarh branch, the Rae Bareli branch and the Purva branch. SSP provides protective canal irrigation for cultivable area of 2 m ha to lakhs of farmers in 150 development blocks of 16 districts in eastern Uttar Pradesh. The project was commissioned in 1974, and completed in 2000 with an estimated cost of Rs. 13 billion. In Nepal, Karnali and Mahakali rivers together have hydropower potential of 36,180 MW (economically exploitable is 25,000 MW) out of a total potential of 83,000 MW. In the Indian state of Uttarakhand, which adjoins the Sharda (Mahakali river), the power generation envisaged is likely to be 6400 MW at 60% load factor (about 24,000 MW at 16% load factor) out of which 2400 MW (9000 MW at 16% load factor) is from the right bank tributaries of the Sharda (Mahakali), excluding the Pancheshwar Multipurpose Project. Some of the projects built/under construction/planned are as under. Tanakpur HEP is a run of the river scheme on the Sharda River (Mahakali River in Nepal) located near the town of Tanakpur in the district of Champawat. It has a Barrage across the Sharda River for diverting river flows into a 6.2 km long power channel of 566 m³/s capacity for utilisation of 24 m head available between the Barrage at Tanakpur and the existing Sharda canal i.e. 0.6 km down stream of Banbasa Barrage. The power station with 3 units of 40 MW (3x40 MW=120 MW) is located near the existing Banbasa Barrage. The tail race channel joins directly the Sharda River. The project is designed to produce 460 million units of power on 90% availability. The construction of the Barrage was started in 1988. In the spirit of furthering co-operation within the Mahakali River area, the Governments of India and Nepal entered into a Memorandum of Understanding (MOU), commonly referred to as the Tanakpur Agreement, on 6 December 1991. The Agreement provided for the construction of the left afflux bund (the retaining wall) on Nepalese territory for which the Nepalese provided 2.9 hectares of land to construct the left afflux bund of 577 m length. As a quid pro quo, the Agreement provided for the installation of a head regulator (main part of the reservoir regulating the water flow) at the Tanakpur Barrage with a capacity of 1,000 cu ft/s (28 m3/s), and required India to construct a canal so that 150 cu ft/s (4.2 m3/s) of water could be delivered to Nepal. India was also required to provide 10 million kWh of power to Nepal with, free of charge. The Tanakpur Project was commissioned in April 1993. But the seething discontent entrenched for nearly five years in Nepal on benefits agreed to be provided by India to Nepal under the agreement of 1991 continued till the Mahakali Treaty between the two countries for the integrated development of water resources on the Mahakali River was signed on 12 February 1996. The Mahakali Treaty has subsumed the regime established by the Sharda Treaty, has validated the controversial Tanakpur Agreement, and endorsed the idea of a new multipurpose project – The Pancheshwar Multipurpose Project (PMP) – the details of which, are being worked out. As per the Treaty, Nepal is now entitled to an annual supply of 70 million kWh of power from Tanakpur HEP on a continuous basis, free of cost, from the effective date of the Mahakali Treaty. For this purpose, India also agreed to construct a 132 kV transmission line all the way to the Indo-Nepalese border from the Tanakpur Power Station. There is provision for the supply of 350 cu ft/s (9.9 m3/s) of water for the irrigation of Dodhara Chandni area. India has also agreed to construct a road linking Tanakpur to Nepal's East-West highway. In compliance of the Treaty provisions mentioned above, the scope of Pancheshwar Multipurpose Project (PMP) is being actively discussed and defined by Nepal and India to enable finalisation of the Detailed Project Report. The proposed project, which straddles the border that lies along the median point of the river, envisages a 293 m high rock fill dam (to be the largest rock fill dam in the world), just downstream of the confluence of the Mahakali and Sarju river, having a live storage capacity of 9.24 BCM and a dead storage capacity of 2.15 BCM. In the project area, the river forms the border between India and Nepal, dividing the Sudurpashchim Pradesh province of Nepal from the Uttarakhand State in India. The PMP also envisages a re-regulating dam for which two alternatives at Purnagiri (1020 MW) and Rupaligad (500 MW) have been considered, to hold the waters passing through the turbines and provide regulated back season release to irrigate designated commands in Nepal and India. Two power stations are projected, one on either bank, with an overall installed peaking capacity, between 5,500 and 6,480 MW at 20 per cent load factor. As per the Treaty principles both sides are committed to design and operate the project as a single, integrated scheme to yield, "the maximum total net benefits accruing to them". The power benefit is to be assessed on the basis of saving in costs as compared with the relevant alternatives available. As per the Treaty "equal entitlement in the utilisation of the waters of the Mahakali River "without prejudice to their respective existing consumptive uses" is also planned to be ensured from the PMP. Chameliya Hydroelectric Project, in Nepal (in the Far Western Development Region), a daily peaking run-off-river (PROR) scheme with an installed capacity of 30 MW, has been taken up for construction during January 2007. The Project lies about 950 km west of Kathmandu on Chameliya river, a tributary of Mahakali river in Darchula district. The Main features of the Project are 54 m high concrete dam, 4.06 km long headrace tunnel, surge tank, penstocks and semi- underground powerhouse with two units of each 15.3 MW vertical shaft Francis turbines. The generated power from the Project will be evacuated through 131 km long 132 kV transmission line. connecting Attariya Substation at Kailali district. ^ a b c Rao, K.L. (year?). India’s Water Wealth. New Delhi: Orient Longmann. ^ a b Design and Construction of selected Barrages in India (1981), Publication number 149, Central Board of Irrigation and Power, Malcha Marg, Chanakyapuri, New Delhi. ^ a b c Central Board of Irrigation and Power (1981). Barrages in India. Publication no. 148. Malcha Marg, Chanakyapuri, New Delhi. ^ a b c World Bank (1987). Nepal and International Inland Waterways issues, Legal Department, Asian Division: World Bank. ^ World Bank (1980), Staff Appraisal Report, Mahakali Irrigation Project Stage I, South Asia Projects Department: World Bank. ^ Water Conflicts in South Asia, Managing Water Resources Disputes within and Between Countries of the Region (2004), Published by GEE-21Honolulu Hi 96825-0517,USA. ^ B.G. Verghese, Water of Hope: From Vision to Reality in the Himalaya- Ganga Development Cooperation, New Delhi: Oxford & IBH Publishing CO.Pvt. Limited, . ^ Project Archived 28 September 2016 at the Wayback Machine. Irrigation.up.nic.in. Retrieved on 18 July 2013. ^ "CHAPTER4". Cag.nic.in. Retrieved 3 August 2012. ^ "Central Water Commission – An apex organization in water resources development in India". Cwc.nic.in. Archived from the original on 21 July 2011. Retrieved 25 August 2010. This page was last edited on 7 February 2019, at 06:02 (UTC).